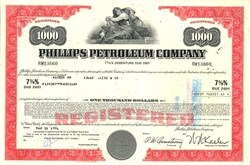 Beautifully engraved Certificate from the Phillips Petroleum Oil Company issued in the 1970's. This historic document was printed by the American Banknote Company and has an ornate border around it with a vignette of an allegorical man sitting next to his helmet with a globe of the world in the background. This item has the printed signatures of the company's officers and is over 30 years old. Phillips Petroleum Company was founded in 1917 by L.E. Phillips and Frank Phillips, of Bartlesville, Oklahoma. Their younger brother, Waite Phillips was the benefactor of Philmont Scout Ranch. Phillips Petroleum was headquartered in Bartlesville, Oklahoma. In 1954, the U.S. Supreme Court decided the landmark case of Phillips Petroleum vs. State of Wisconsin which held that the Federal government should regulate under the Natural Gas Act the prices which natural gas producers charge when selling gas at the wellhead. In late 1984, Mesa Power LP Company, led by T. Boone Pickens, Jr., attempted a hostile takeover of Phillips Petroleum. 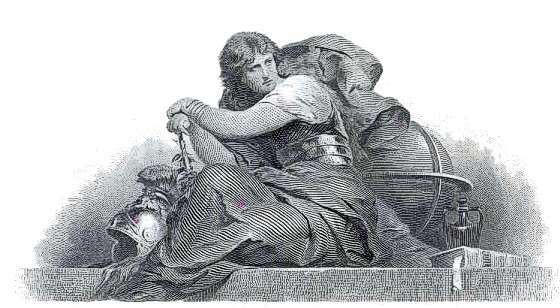 Phillips remained an independent company, but recapitalized with greater debt. On August 30, 2002, Conoco Inc. merged with Phillips Petroleum to form ConocoPhillips. The best-known brand of Phillips Petroleum is Phillips 66, named in part for US Highway 66.